Poetry as performance art was lost on me. I rarely ever recited my work in front of others. Nor did I attend any readings or watch any recorded performances. Poetry was just another way for me to tell stories. 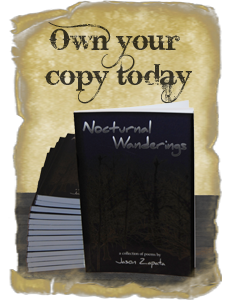 This changed when Nocturnal Wanderings was published. Promoting my first book meant reciting poems for potential readers. I’m now attending readings and find them entertaining. It’s enjoyable watching others present their material and challenging to recite your own.